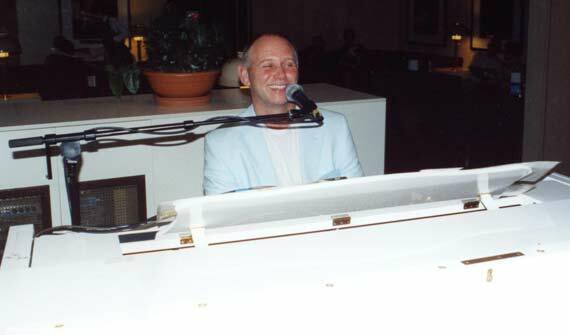 Tony B is a wedding musician, pianist, singer & entertainer who provides wedding music and entertainment for every aspect of your wedding day. His repertoire of over 500 songs covers many styles from the fifties to current chart hits and includes pop, rock, disco, party music, background music, classical and singalong music - something for all age groups and tastes. Tony lives on the Derbyshire / Staffordshire border & performs at weddings all of the UK. He can perform different styles of music for all aspects of your wedding day & is a professional, experienced wedding pianist & wedding singer, musician & entertainer. As a wedding pianist / wedding singer he can play during your champagne drinks reception, wedding breakfast / reception. He can also entertain as the wedding musician / entertainment for your evening function. Choose your favourite songs from his song list and he will endeavour to incorporate them into your celebrations. Before your wedding breakfast / reception or evening party and whilst your guests arrive is the perfect time for your everyone to relax and get acquainted with one another and in the mood for the wedding breakfast or evening party to follow. This is the perfect time for people to mingle, have a chat & catch up on old times. The music would be a mixture of well known songs for easy listening and I would also take requests and keep the music at a comfortable volume so that guests are able to converse easily. Before your wedding breakfast / reception, whilst your guests arrive and during the meal I would play a selection of ballads, love songs and background music that would be unobtrusive to your guests and create the right ambience for your wedding reception. If there were any songs that you would like me to play, I would include them also and I would supply the subtle background music in my break or for any of your favourite tracks. The music I would perform for your evening function would be different to the music for a civil ceremony or a wedding breakfast (outlined above). You would be able to choose a song for your first dance and any others that you may like. During the evening I would play a variety of dance, party music and singalong crowd pleasers for all ages and tastes, any requests from my song lists are welcome. Some couples like to have a disco as well as myself, which always works well by giving a variety of 'live' and recorded music. I would work with the DJ to make the evening flow smoothly and keep your guests happy with our different styles of music. Music for civil ceremonies will be chosen by yourselves and could include ballads, love songs or classics, with vocals or played just on the piano / keyboard. I always carry a CD player with me, so if you would like to supply a CD with your favourite pieces for the ceremony, that could also be accomodated. Please allow me to supply a quote for any of the different wedding entertainment packages outlined above or you may choose to combine them. Distance is no object but if an overnight stay is involved then an additional cost will need to be added to the price. Tony B - Wedding pianist singer, wedding musician, piano keyboard vocalist, wedding pianist, wedding singer, live music & wedding entertainment, wedding music, civil ceremonies, civil weddings, wedding receptions, wedding breakfast and evening functions - professional, experienced, versatile and adaptable.